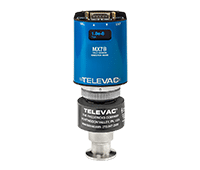 The Fredericks Company’s Televac® vacuum measurement brand designs and manufactures active vacuum gauges that combine Televac’s passive vacuum gauges and controlling electronics into one compact unit. Our active vacuum gauges cover the entire practical vacuum measurement range from 10-11 Torr to 1000 Torr and feature bright OLED displays and easy to use touch controls, in addition to RS-485 communications, allowing the user to adjust settings such as vacuum measurement units, set points, and calibration directly through the unit’s display or remotely through digital communications. Active vacuum gauges are a compact, easy to use, and cost effective solution for a wide range of vacuum measurement applications, the most common being heat treat and vacuum furnaces and semiconductor manufacturing equipment. Looking for full-range vacuum measurement and not sure where to start? Check out our MX4A active convection gauge and our MX7B active cold cathode gauge, when used together these units provide a vacuum measurement range of 10-8 Torr to 1000 Torr. Click here to learn more! What’s an active vacuum gauge? 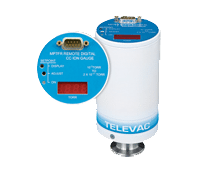 Terminology varies from different manufacturers, but at Televac we differentiate between passive vacuum gauges and active vacuum gauges (check out our terminology reference). A passive vacuum gauge (sometimes referred to as a vacuum sensor), such as our 2A thermocouple gauge or our 7B cold cathode gauge, needs controlling electronics to convert the electrical signal from the gauge into a vacuum measurement. This conversion can be done by a vacuum controller, which can control multiple gauges at a time, or by an active vacuum gauge, where the control electronics are integrated into an assembly which is directly attached to the passive vacuum gauge. Active gauges are also sometimes called digital vacuum gauges or analog vacuum gauges, because they have a digital display and digital communications, along with an analog 0 to 10 V DC output. Active vacuum gauges vs. vacuum controllers – why would I select a vacuum controller? The primary differences between a vacuum controller solution and an active vacuum gauge solution are the positioning of the control electronics (and display), and the ability of a vacuum controller to connect and display the readings from multiple passive vacuum gauges simultaneously. With a vacuum controller, the passive vacuum gauges are connected by cables to the vacuum controller, allowing separation of the control electronics and vacuum sensors by anywhere from 10 feet to 300 feet. This is particularly useful for environments where radiation is present (electronics are quickly and damaged by radiation), or in applications where vacuum measurements must be displayed remotely or in a different location from the vacuum sensors. Active vacuum gauges vs. vacuum controllers – why would I select an active vacuum gauge? The MX2A active thermocouple gauge features the Televac passive 2A thermocouple gauge (sometimes called a Pirani gauge), one of our most robust and contamination resistant low vacuum gauges due to its filament design and operating temperature. This compact unit measures from 10-4 Torr to 1000 Torr and comes standard with a color OLED display, touch controls, RS-485 communications, and an analog 0 to 10 V DC output corresponding to its vacuum measurements. Sensor replacement is fast and simple with no screws to remove. 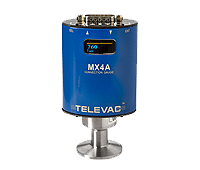 The MX4A active convection gauge utilizes the Televac passive 4A convection gauge (also sometimes called a Pirani gauge) and measures from 10-4 Torr to 1000 Torr, offering ±10% accuracy over its operating range. This low cost, compact unit features a color OLED display, touch controls, RS-485 communications, programmable set points, and an analog 0 to 10 V DC output corresponding to its vacuum measurements. Sensor replacement is fast and simple with no screws to remove. 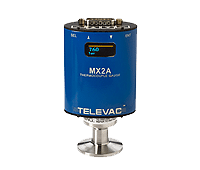 The MX7B active cold cathode gauge features the Televac passive 7B cold cathode gauge and measures from 10-8 Torr to 10-3 Torr, and provides full range vacuum measurement when combined with the MX4A active convection gauge. Our patented Penning cold cathode gauge technology offers superior contamination resistance compared to competing cold cathode gauges. Like our other MX Series active gauges, the MX7B is equipped with an easy to read OLED display, touch controls, RS-485 and USB communications, and an analog 0 to 10 V DC output. The 7B sensor is fast and simple to remove (only one screw) for cleaning or replacement to extend the gauge’s life. 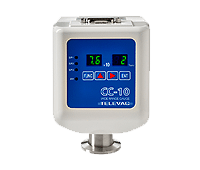 The CC-10 active wide range gauge is a wide range active vacuum gauge that utilizes dual sensor technology to deliver seamless measurement from 10-9 Torr to 990 Torr. A crystal sensor measures from atmosphere to 10-3 Torr and our patented double inverted magnetron cold cathode gauge is used to measure from 10-2 to 10-9 Torr. The CC-10 features an easy to use front panel with an LED display so options can be set using the touch controls or though RS-485 communications. It also has built-in set points and features an analog 0 to 10 V DC output corresponding to its vacuum reading. 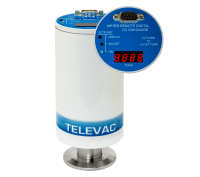 Looking for an active vacuum gauge with Ethernet/IP communications? 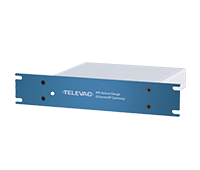 The new MX Active Gauge EthernetIP Gateway provides EthernetIP communications and power connections for up to 4 Televac MX active vacuum gauges and 1 capacitance diaphragm gauge (CDG). All MX active vacuum gauge features are accessible via EthernetIP, allowing you to integrate things like calibration and changing gas types into your PLC and HMI.